I must admit to feeling a little apprehensive when F&C's editor invited me to write a series of articles on routing, since I don't consider myself to be a router enthusiast as such, never mind an expert on the subject. I'm merely a designer-maker who makes use of the router, along with other machines and power tools, in the pursuit of fine furniture-making. Regular readers will know I've a great respect for traditional skills and consider the mastery of hand tools and techniques to be of great value in the development of a furniture-maker. Quite apart from their intrinsic value in terms of making, hand tools force us into intimate contact with our material. They help us gain a fuller understanding of wood: its structure, limitations and possibilities. This co-ordination between hand, eye and mind also helps develop our design abilities too, I believe. I'm grateful, therefore, that I was taught to cut a housing accurately with chisels, mallet and old-fashioned, non-powered hand-router - which still has its uses now and again - to give just one example. There are some things I prefer to do by hand even today, such as dovetailing. However, long ago I recognised the many benefits of the high speed plunge router and have completely worn out one machine. I'm now on the third set of bearings on a second router, not through any manufacturing fault or abuse, but simply because it does a great deal of work. So perhaps I am a router disciple after all! This series is intended for the newcomer to fine furniture-making, or readers who have recently bought, or are thinking of getting a router. I hope to explain how we can use this wonderfully versatile piece of equipment to our advantage. All the techniques described are ones I use in my day-to-day work rather than being simply dry, technical exercises and the equipment used is that of my choice, whether bought or home-made. Wherever possible the photographs will be of actual furniture projects I'm working on. Routers fall into two broad categories: machines intended for light and medium-duty applications, which accept cutters with 1/4in diameter shanks, generally around 800W capacity, and their heavy-duty big brothers in a power range from around 1400 to 2000W, designed to accept cutters with 1/2in shanks but will take smaller cutters too. Not surprisingly, these machines are conveniently referred to as 'quarter-inch' and 'half-inch' routers respectively. - Is the ON/OFF switch easy to use and conveniently placed? - Does it have a 'soft start' and variable speed control? - Do the handgrips give good control and are they comfortable for your own hands? - Is the plunge action smooth? Is the locking mechanism positive and well located and, crucially, is there a good depth of travel, important when used in a table? - Is the fence sturdy yet not too cumbersome, and does it have provision for fine adjustment? - Are the calibrations on the depth stop easily legible and is it straightforward to use? - If you are likely to need to use your router on-site away from the workshop, does the manufacturer provide a carrying case to protect it in transit? - Is there an agent in your area who can service or repair the machine if it breaks down, and are spare parts such as motor brushes and collets readily available? Excellent sources of information are the test reports available from F&C, which will help answer some of the above questions and make your choice more informed. Half-inch routers are able to take a huge range of cutters, and while still designed to be hand held, really come into their own when mounted in a table and for many of us are able to do pretty well everything a spindle moulder can. Used in this mode, weight and handling is less of an issue, but depth of travel and good access for fine-height adjustment are crucial to efficient operation. Again, research the market, work out what you actually need from a heavy-duty machine, and you should end up with the right one. - Store the router in its case or in a cupboard, never in a place where dust, grit and shavings can enter the air vents of the motor. Vacuum it regularly to remove the inevitable dust which will accumulate simply through use, but do not use an airline, which will only force dirt further into the machine. - Keep the plunge columns clean and free from any build up of grime and lubricate occasionally with a light machine oil. Never use steel wool or other abrasives on them, instead use a suitable solvent to remove stubborn dirt. A smooth plunge action is essential for safe and accurate operation. - When switching on, set the rpm at its lowest speed, then turn to the required setting to prolong bearing and motor life. - Periodically examine the base for scratching and scoring and replace accordingly. - Check the power lead and have it replaced if perished or cut. At the intervals recommended by the manufacturer, have the machine checked over by an authorised service agent. This way, your router is less likely to let you down in the middle of a job. The need to keep this free from baked on deposits of debris, scoring and corrosion vital for accuracy of cutter insertion and longevity of components: a dirty collet can cause the cutter to slip, leading to damage caused by overheating, and injury to the workpiece. Build up of deposits may also lead to the cutter being slightly eccentrically secured in the armature, causing vibration, inaccurate cutting and increased stress on the bearings. All these problems are easily avoided by regular inspection and cleaning with fine wire brushes and an application of anti-rust lubricants such as those provided in the Trend collet and cutter-care kit. Any collet which is scored, corroded or requires excessive force to tighten should be replaced. Finally, never leave a cutter in the router if it's not in use for a long period, since this can cause it to seize solid in the collet. The easiest way to ruin your growing collection of cutters is to leave them rolling around in a drawer or box. An excellent storage solution is to bore rows of suitable diameter holes in a piece of MDF into which the shanks sit, and then put it in a drawer. This arrangement takes little time to make, keeps the cutters apart, makes selection easy, and protects the shanks. A word of warning though, whilst British cutters have imperial shank diameters: 1/4in (6.35mm), 3/8in (9.5mm) and 1/2in (12.7mm) continental cutter shanks are 6mm, 8mm and 12mm in diameter. 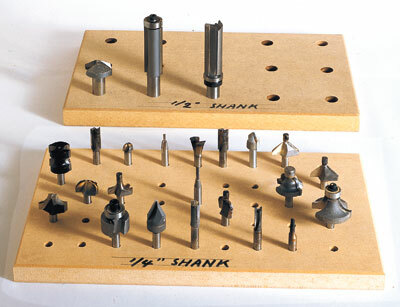 Cutter storage boards should be labelled with the shank diameter to prevent a cutter being accidentally tightened into the wrong size collet, causing damage to shank and collet alike. Ready made storage cases are available from cutter manufactures and these are recommended for those working away on-site. Cutters should be free from deposits of gum and other debris, by cleaning with wire brushes and purpose-made solvents and lubricants. Bearing guides should be checked for free running and replaced if faulty. On no account, however, should solvents or lubricants be applied to bearing guides as this will disturb the factory-packed grease and lead to premature failure. Just as it's important to keep the surfaces of collets clean and bright, so too should the shanks of cutters. These can be rubbed with 0000 grade steel wool and polished with metal polish to keep them in perfect condition. After cleaning, cutters will benefit from being sprayed with a PTFE dry lubricant such as that available from Trend. This will help prevent the build up of deposits, particularly if the cutter is to be used on gummy woods such as cherry or one of the pines. It goes almost without saying that router cutters must be kept sharp. Both HSS and TCT cutters can be honed quite satisfactorily a number of times on purpose made diamond sharpening stones before they need professionally regrinding. The important point to remember is that the face of the cutter only should be sharpened, otherwise the profile will be altered and the cutter ruined. If in any doubt about your ability to sharpen cutters, it's better to send them to a saw doctor - manufacturers of cutters often offer a sharpening service - especially with the more expensive items. In the case of inexpensive small diameter cutters it's usually cheaper just to go out and buy a new one rather than pay to have them reground. While not quite in the league of the spindle moulder or dimension saw for its capacity to maim and injure, the router still needs to be treated with respect and safety rules should be observed. Before even plugging in a new router, read the instruction book carefully and thoroughly examined the machine to familiarise yourself with all its controls and adjustments. 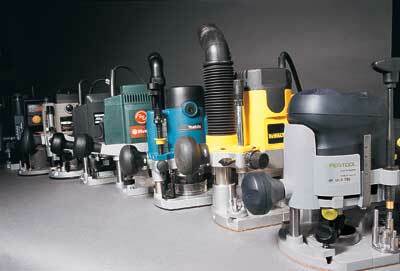 - Carry out all adjustments, including fitting cutters, with the machine switched off and unplugged. - In the event of a power cut, return the switch to OFF. - Cable management: ensure that the power cable and dust extraction pipe cannot get entangled on you, the machine, workpiece or the bench vice. - Ensure there is adequate lighting. - Secure the workpiece firmly to the bench. - Wear earmuffs, safety glasses and a dust mask. - Fit the dust extraction attachment and connect it to an efficient workshop vacuum cleaner. - Do not wear loose clothes, do roll up your sleeves and tie back long hair. - Never start the machine with the cutter touching the workpiece. - Always guide the router with both hands. - Always retract the cutter and allow to come to a complete standstill before removing the router from the workpiece. In the next instalment I'll examine the right way to fit a cutter - and start work! "The router needs to be treated with respect and safety rules should be observed"
Single-flute cutters These have a single cutting edge, capable of fast cutting but with a correspondingly less fine finish. Available from 1.5mm diameter upwards and a variety of lengths. The smallest are great for fine inlay work but are obviously delicate and must be used with care. the furniture-maker. Available from 2mm diameter upwards. Shaped cutters Generally two-fluted, available in traditional moulding profiles such as the ogee, cavetto and staff bead for example. A boon to the maker of classic English furniture. 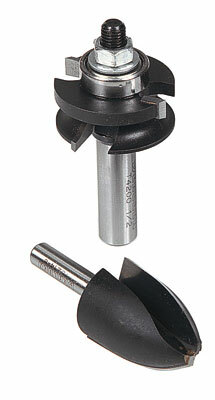 Pin-guided cutters Some shaped cutters are available with a small, fixed pin at the end for freehand edge work. Useful in confined spaces but with a tendency to scorch the workpiece. 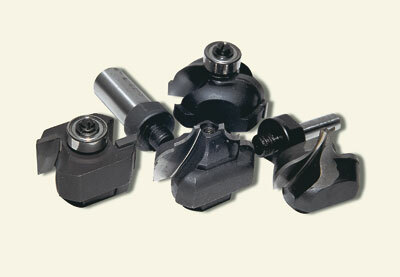 Bearing-guided cutters Self guiding cutters with a freely rotating guide either at the end or on the shank. More versatile than the fixed-pin version, since different diameter guides can be fitted to the same cutter to change the profile it cuts from, for instance, a roundover to an ovolo. 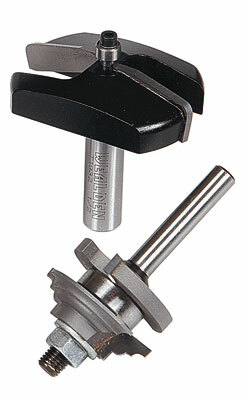 the profile and scribing cutters for making the ubiquitous 'traditional' kitchen cabinet doors. High Speed Steel (HSS) Machined from a single piece of steel with finely ground cutting edges, these are the least expensive cutters and capable of giving the finest finish. They soon loose their edge, however, but are the best choice on softwoods for a clean, crisp cut. Tungsten Carbide Tipped (TCT) Similar in construction to a TCT circular sawblade, these have high grade steel body with tungsten carbide tips brazed to each flute. Will perform well on abrasive timbers, and essential when machining MDF and laminated work glued with synthetic resins such as Cascamite. Although extremely hard, TCT is a brittle material prone to chipping if roughly handled. Solid Tungsten Carbide Ground from a solid piece of tungsten carbide, these are more robust than tipped cutters and can be resharpened more times. A good example of this type is the engraving cutter by Trend. 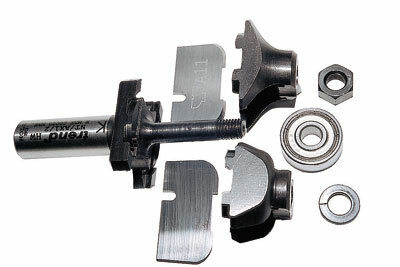 Replaceable tip cutters These consist of a permanent steel body to which replaceable blades are fixed with retaining screws. Makes include the 'Versofix' and 'Easi-Tip' systems from Wealden Tool Company and the recently introduced 'Nova System' from Trend, effectively a spindle moulder block in miniature.